Compact bone: the heaviest, hardest type of bone in the body. Lining cell: flat cells that make up and cover the outer layer of bone. Osteoblast: cells make new bone. Osteoclast: cells in your body that break down bone material in order to reshape it. Osteocyte: a star shaped bone cell with long branching arms that connect it to its neighboring cells. Osteon: tube shaped structure in bones with an open space for blood vessels, veins, and nerves in the center. Have you ever seen fossil remains of dinosaur and ancient human bones in textbooks, television, or in person at a museum? It's easy to look at these and think of bones as dry, dead sticks in your body, but this couldn't be further from the truth. Bones are made of active, living cells that are busy growing, repairing themselves, and communicating with other parts of the body. Lets take a closer look at what your bones do and how they do it. The skeleton of an adult human is made up of 206 bones of many different shapes and sizes. Added together, your bones make up about 15% of your body weight. Newborn babies are actually born with many more bones than this (around 300), but many bones grow together, or fuse, as babies become older. Some bones are long and thick, like your thigh bones. Others are thin, flat, and wide, like your shoulder blades. The adult human skeleton has 206 bones. Click on the image to see a larger version. Support: Like a house is built around a supportive frame, a strong skeleton is required to support the rest of the human body. Without bones, it would be difficult for your body to keep its shape and to stand upright. Protection: Bones form a strong layer around some of the organs in your body, helping to keep them safe when you fall down or get hurt. Your rib cage, for example, acts like a shield around your chest to protect important organs inside such as your lungs and heart. Your brain is another organ that needs a lot of protection. The thick bone layer of your skull protects your brain. For this purpose, being "thick-headed" is a very good thing. Movement: Many of your bones fit together like the pieces of a puzzle. Each bone has a very specific shape which often matches up with neighboring bones. The place where two bones meet to allow your body to bend is called a joint. How many different ways can you move your joints? Some bones, like your elbow, fit together like a hinge that lets you bend your arm in one specific direction. Other bones fit together like a ball and socket, such as the joint between your shoulder and arm. This type of joint lets you rotate your shoulder in many directions, or swing it all the way around in a circle like softball pitchers do. The movement of our bodies is possible because of both joints and muscles. Muscles often attach to two different bones, so that when the muscle flexes and shortens, the bones move. This allows you to bend your elbows and knees, or pick up objects. A skeleton has plenty of joints, but without muscles, there is nothing to pull the bones in different directions. More than half of the bones in your body are actually located in your hands and feet. These bones are attached to many little muscles that give you very exact control over how you move your fingers and feet. Examples of the different kinds of joints in your body. Blood Cell Formation: Did you know that most of the red and white blood cells in your body were created inside of your bones? This is done by a special group of cells called stem cells that are found mostly in the bone marrow, which is the innermost layer of your bones. Storage: Bones are like a warehouse that stores fat and many important minerals so they are available when your body needs them. These minerals are continuously being recycled through your bones--deposited and then taken out and moved through the bloodstream to get to other parts of your body where they are needed. Cross section of a bone. What Are Your Bones Made Of? Now that you know what bones do, let's take a look at what they're made of and their anatomy. Each bone in your body is made up of three main types of bone material: compact bone, spongy bone, and bone marrow. Cross section showing osteons. The large dark spots are passages for blood vessels and nerves. The little black spots are osteocytes. Compact bone is the heaviest, hardest type of bone. It needs to be very strong as it supports your body and muscles as you walk, run, and move throughout the day. About 80% of the bone in your body is compact. It makes up the outer layer of the bone and also helps protect the more fragile layers inside. If you were to look at a piece of compact bone without the help of a microscope, it would seem to be completely solid all the way through. If you looked at it through a microscope, however, you would see that it's actually filled with many very tiny passages, or canals, for nerves and blood vessels. Compact bone is made of special cells called osteocytes. These cells are lined up in rings around the canals. Together, a canal and the osteocytes that surround it are called osteons. Osteons are like thick tubes all going the same direction inside the bone, similar to a bundle of straws with blood vessels, veins, and nerves in the center. 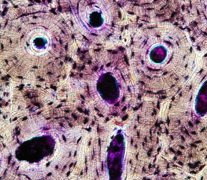 Looking at the osteons in bone (A) under a microscope reveals tube-like osteons (B) made up of osteocytes (C). These bone cells have long branching arms (D) which lets them communicate with other cells. Close up view of spongy bone. Spongy bone is found mostly at the ends of bones and joints. About 20% of the bone in your body is spongy. 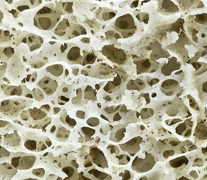 Unlike compact bone that is mostly solid, spongy bone is full of open sections called pores. If you were to look at it in under a microscope, it would look a lot like your kitchen sponge. Pores are filled with marrow, nerves, and blood vessels that carry cells and nutrients in and out of the bone. Though spongy bone may remind you of a kitchen sponge, this bone is quite solid and hard, and is not squishy at all. The inside of your bones are filled with a soft tissue called marrow. There are two types of bone marrow: red and yellow. Red bone marrow is where all new red blood cells, white blood cells, and platelets are made. Platelets are small pieces of cells that help you stop bleeding when you get a cut. Red bone marrow is found in the center of flat bones such as your shoulder blades and ribs. Yellow marrow is made mostly of fat and is found in the hollow centers of long bones, such as the thigh bones. It does not make blood cells or platelets. Both yellow and red bone marrow have many small and large blood vessels and veins running through them to let nutrients and waste in and out of the bone. When you were born, all of the marrow in your body was red marrow, which made lots and lots of blood cells and platelets to help your body grow bigger. As you got older, more and more of the red marrow was replaced with yellow marrow. The bone marrow of full grown adults is about half red and half yellow. Bones are made of four main kinds of cells: osteoclasts, osteoblasts, osteocytes, and lining cells. Notice that three of these cell type names start with 'osteo.' This is the Greek word for bone. When you see 'osteo' as part of a word, it lets you know that the word has something to do with bones. Osteoblasts are responsible for making new bone as your body grows. They also rebuild existing bones when they are broken. 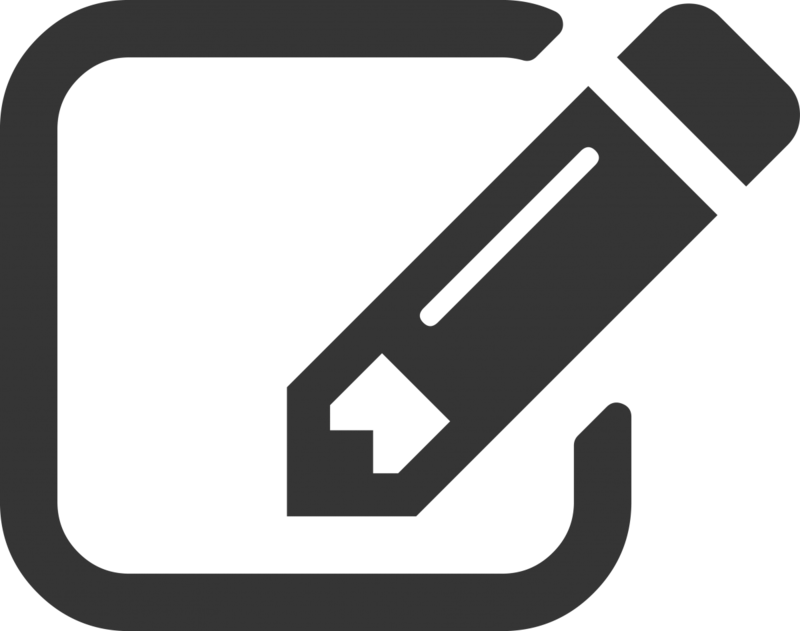 The second part of the word, 'blast,' comes from a Greek word that means 'growth.' To make new bone, many osteoblasts come together in one spot then begin making a flexible material called osteoid. Minerals are then added to osteoid, making it strong and hard. When osteoblasts are finished making bone, they become either lining cells or osteocytes. Osteocytes are star shaped bone cells most commonly found in compact bone. They are actually old osteoblasts that have stopped making new bone. As osteoblasts build bone, they pile it up around themselves, then get stuck in the center. At this point, they are called osteocytes. Osteocytes have long, branching arms that connect them to neighboring osteocytes. This lets them exchange minerals and communicate with other cells in the area. Lining cells are very flat bone cells. These cover the outside surface of all bones and are also formed from osteoblasts that have finished creating bone material. These cells play an important role in controlling the movement of molecules in and out of the bone. When a bone breaks, a thick lump of bone called a hard callus forms around the break in the process of healing. The callus is slowly broken down by osteoclasts until the bone is returned to its original shape. When new blood vessels, nerves, and veins are needed in an area, osteoclasts break down bone material to make new passages. Bones that are used more often and need to support more weight, such as the bones of athletes, become thicker and stronger over time. Bones that are used less often, such as those that need to be put into a cast for long periods of time, are broken down, becoming smaller and thinner. It's not completely understood how bone cells in your body are able to work together and stay organized, but pressure and stress on the bone might have something to do with it. The smallest bone in the human body is called the stirrup bone, located deep inside the ear. It's only about 3 millimeters long in an adult. The longest bone in the human is called the femur, or thigh bone. It's the bone in your leg that goes from your hip to your knee. In an average adult, it's about 20 inches long. Skeleton Image: By Lady of Hats - Mariana Ruiz Villarreal, via Wikimedia Commons. Take a tour inside the human body with our virtual Skeleton Viewer.